Our collection of Mahler manuscript scores may now be viewed online at the Internet Archive. The Mahler-Rosé Collection was donated to The University of Western Ontario in October, 1983 by Mrs. Maria C. Rosé, widow of Professor Alfred Rosé, who was the nephew of composer Gustav Mahler and the son of Arnold Rosé (Concertmaster of the Vienna Philharmonic Orchestra, and leader of the Rosé String Quartet). The collection is currently being housed in the Archives and Research Collections Centre in the D.B. Weldon Library. This Collection represents a significant addition to the knowledge of Gustav Mahler, and is required material for any serious scholar involved in research into the life and times of the composer, and the life and times of his brother-in-law, Arnold Rosé, or his nephew, Alfred Rosé. The original donation can be separated into three distinct groupings. The first of these consists of 521 personal letters from Mahler, chiefly to his sister Justine. It also consists of more than 130 "celebrity letters" to Gustav Mahler and Arnold Rosé. The letters written to Mahler to his sister Justine and to his parents reveal the earlier years of Mahler's development as a musician, his quick mastery of all his studies and the rousing acclaim accorded to this young and promising genius. The materials also contain Mahler's comments on historical and social developments of the day: for instance, he was entranced by saccharin -- sent samples to his family and assured them he could obtain as much as they could use. The intrigues and politics of obtaining a coveted position in the Vienna State Opera are detailed, as are the various sums paid to members of the Orchestra. Mahler's reflective aspect is revealed in a letter to Josef Steiner in which he contemplates life and nature, and in his note justifying his Retouchen to Beethoven's Ninth Symphony [E7-MD-349]. Justine had an extensive celebrity autograph collection. It was for her that her brother Gustav, and her husband Arnold Rosé, saved the personal, the laudatory, and the congratulatory letters from such well-known persons as Nellie Melba, Adelina Patti, Princess Metternich, Wanda Landowska, Moritz Rosenthal, Jacob Dont, Hans Schliessmann, Arnold Schönberg, Max Bruch, Max Reger, Pietro Mascagni, Richard Strauss, Anton Bruckner, Anton Webern, Engelbert Humperdinck, Antonín Dvorák, Ethel Smyth, Erich Wolfgang Korngold and many others. The second grouping of Mahler-Rosé materials consists of letters and postcards written by Mahler to his family during the period of ca. 1880-1910. These full and frank personal letters show the young genius establishing himself in the musical communities of Prague, Leipzig, Budapest, Hamburg, Vienna and other great cities. There is a heady atmosphere as Mahler recounts glittering success -- he does the Wagner cycle; is appointed to the directorship of the Vienna State Opera; "tonight for the first time, Siegfried! "; the emperor is to attend; all of which are in juxtaposition with nagging and petty personal details: he has a cold; dissatisfaction with winter; stomach problems; and, soaring over all, his exhilaration at meeting fellow composers, conductors, musicians: his comments regarding Richard Strauss "one of the most considerable composers who probably has a great future ahead of him," while contrasting with the political realities of the day "the atmosphere is very warlike." This grouping provides an unparalleled intimate look at the developing years of a brilliant young musician and of his perceptive and penetrating comments and opinions of events and personalities of the day. The third grouping of Mahler-Rosé materials is a collection of approximately 61 letters, 12 postcards, 2 notes and 20 or so assorted items. Also included are a number of programmes, posters, and tickets from performances of Mahler's own works, conducted by himself, including the First Symphony (27 October 1893); the Second Symphony (9 April 1899 and 24 November 1907); and the Eighth Symphony (12-13 September 1910). There is also a poem written in tribute to Arnold Rosé written and signed by the author-poet Franz Werfel, in honour of the occasion of Arnold Rosé's 70th birthday, celebrated by the Vienna Philharmonic on 24 October 1933; and there is Erich Wolfgang Korngold's music for Lieder des Abschieds, opus 14, bearing on the opening page a hand-written dedication to Alma Rosé. Within this third grouping are also found the manuscripts and scores of the Collection. Some of the highlights would include the earliest known manuscript of Mahler's Symphony no. 1 (copyist's manuscript, with annotations in Mahler's hand). There is a manuscript copy, in the hand of Alfred Rosé, of Mahler's Clavier-Quartett, 1. Satz. On three pages of Vienna State Opera stationery is the text of Des Knaben Wunderhorn, in Mahler's hand. Other Mahler autographs include the Josephinen Lieder for tenor and piano, several songs, and a few measures of the second movement of the Fourth Symphony (1 January 1902) with a note from Mahler. There is a copy of the original first movement of Das Klagende Lied (Waldmärchen) in the hand of Alfred Rosé and also choral parts and a piano-vocal score prepared by Rosé for the world premiere of Waldmärchen, which he conducted in 1934. There are a number of photocopies of manuscripts of Mahler's works, as well as a copyist's manuscript of Bruno Walter's Sonata for Violin and Piano composed for Arnold Rosé. This grouping also includes a manuscript of Alfred Rosé's Piano Sonata in A major, 1937, and his songs composed in 1939. Thirty-eight letters from Mahler to his parents and sister Justine comprise the bulk of this supplement. Of the three remaining letters, two are written to Mahler: Carl Goldmark (11 January 1897) and Richard Strauss (22 April 1900); the latter, a letter to Arnold Rosé from Max Reger (28 July, 1908). This collection was in the possession of Ernest Rosé of Washington, son of Emma Mahler and Eduard Rosé, and consists of four letters by Mahler (one written in collaboration with his sister Justine) to family members; six letters from Justine to Emma; ten letters from Bruno Walter to Mahler, Justine or Emma; four cabinet card photographs of Walter; and a draft of a letter by Arnold Rosé (in Mahler's hand) withdrawing the offer of a position with the (Rosé Quartet) to the cellist Rudolf Krasselt, citing an unpleasant situation between Krasselt's brother (Concertmaster in Weimar) and his behaviour toward Arnold's brother Eduard Rosé. Contained in this Supplement is additional material relating to Mahler, chiefly published first and early editions of his works, photographs and memorabilia, and a single letter from Mahler to Ernestine Löhr. Included is a lock of Mahler's hair, 44 photographs of Mahler alone and with others, a signed and inscribed photo of himself which Mahler gave to Arnold Rosé, and numerous photographs of Mahler family members. Photographs figure prominently in this Supplement: Arnold Rosé's parents and family; the Rosé Quartet during its long career; Arnold with musicians Richard Strauss, Toscanini and Lotte Lehmann; and Alfred Rosé, alone and with other musicians, and also with his wife Maria Rosé. Several letters from Elisabeth Schumann to Alfred Rosé are included, as are letters from Lotte Lehmann, Arnold and Justine Rosé, and Alice Strauss. Alfred Rosé memorabilia is extensive: lists of lectures, performances and compositions; writings and lectures; programmes; autobiographical essays; scrapbooks of press clippings (1939-1975); correspondence with friends and former students; manuscripts and scores; newspaper articles and notes for his CFPL Radio programme on opera. Also included are presentation scores inscribed/signed by various composers (John Cook, A. Louis Scarmolin, Gerald Cole) and given to Alfred Rosé. Memorabilia of Mrs. Maria Rosé is present in this Supplement: programmes, a 70-page biographical sketch, articles on household matters written by her, and published in the Neue Freie Presse (1937) and published articles about Ferdinand Schmutzer and Susanne Peschke-Smutzer, Mrs. Rosé's father and sister, both artists. 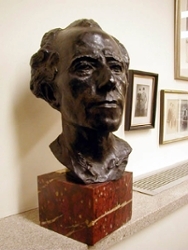 Sculpture, etchings and memorabilia predominate this Supplement, most notably the Rodin bronze bust of Mahler ["Bust "B"], Ferdinand Schmutzer's etchings of: Richard Strauss; Arnold Rosé; and the Vienna Philharmonic in the Musikvereinsaal, Weingartner conducting (1926, 44/50), a large etching of the Rosé Quartet by Schmutzer's pupil Stössel, and a bust of Arnold Rosé by Susanne Peschke-Schmutzer. Additional Mahler memorabilia includes a wooden baton (with an inked attribution in the hand of his sister, Justine), the silvered fruit bowl given to Mahler upon his departure from Budapest (1891), the Mahler family silver service, photographs of Mahler and Justine, and photocopies or transcriptions of Mahler letters sold by Alfred Rosé, and correspondence regarding the sale of same. An extremely rare letter also survives, written by Mahler's brother Otto to an unknown correspondent. The Rosé Quartet and Alfred Rosé are well-represented by 90 programmes from a number of their tours, with Alfred Rosé as pianist (1922-38); programs of recitals given by Alfred Rosé as both pianist and accompanist are included. Framed photographs signed by Puccini, Johann Strauss Jr., Richard Strauss, Toscanini, Verdi are inscribed (to Arnold or Alfred Rosé) are grouped on the northwest wall of the Room. Arnold Rosé was the recipient of many honours and awards during a long and distinguished musical career; while the printed citations and certificates were received as part of the original donation, the accompanying medals were received in 1995. Memorabilia relating to the life and career of both Alma Rosé (1906-1944) and her father Arnold Rosé (1863-1946) figure prominently in this Supplement, which includes photographs, programmes and correspondance (the latter being primarily family letters, and including letters from Bruno Walter, numerous cards from well-wishers on the occasion of Arnold's 80th birthday, and condolences to Alfred and Maria on Arnold's death). Named for her aunt, Alma Mahler (wife of composer Gustav Mahler), Alma Rosé was a violinist who made her musical mark as the leader of the Wiener Walzermädeln - "The Vienna Waltzing Girls" - a touring women's orchestra active throughout Europe during the 1930's. Several photographs and programmes of the Wiener Walzermädeln survive in this Supplement. Arnold Rosé formed and led the Rosé Quartet (active 1883-1930's; Rosé reconstituted the Quartet while in England, performing into his 80's) and was Concertmaster of theVienna Philharmonic and Opera orchestras from 1884-1938. The Nazi Anschluss forced Arnold's retirement from the Vienna Philharmonic Orchestra in 1938; given Arnold's straitened circumstances, Carl Flesch initiated a 'subscription' on Arnold's behalf - to which numerous friends contributed to fund Arnold's exile to England. Alma and her father fled there in early 1939: their letters to Maria and Alfred Rosé comprise the bulk of the correspondance contained in this Supplement. The University of Western Ontario is grateful to Mrs. Rosé for this most generous donation. As knowledge of the existence of the Collection spreads, the reputation of the University and of the Music Library will, no doubt, be enhanced by its presence here. Please consult our Bibliography for further research on the Mahler-Rosé Collection. McClatchie, Stephen. The Gustav Mahler - Alfred Rosé Collection: An Inventory. London:The University of Western Ontario Library System, 1996.